While venture capital news is usually dominated by U.S.- or China-based funding rounds, Latin America has steadily emerged as a vibrant technology hub. 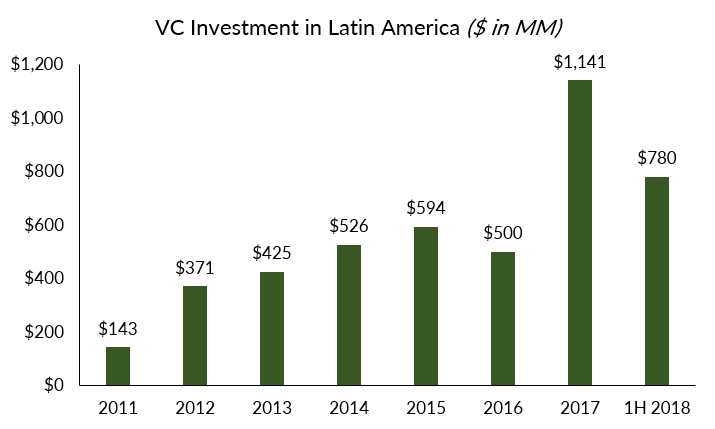 From 2011 through 2017, venture capital invested in Latin America nearly septupled, growing from $143 million to over $1.1 billion at a strong 41.4% compounded annual growth rate. In 2018, venture capital invested in Latin American startups hit $780 million in the first half of the year, implying a nearly $1.6 billion run rate for all of 2018. Although Brazil has attracted the majority of this VC funding ($859 million in 2017), other major Latin American economies have experienced breakout growth in recent years, including Colombia (269% in 2017 YOY), Argentina (208% in 2017 YOY) and Chile (109% in 2017 YOY). Although VC funding in Mexico was down 39% in 2017 YOY, the country bounced back in 1H 2018, with $75 million invested across 23 deals compared to $36 million invested across 19 deals in 1H 2017. Of the almost $2 billion invested in Latin American startups since the beginning of 2017, fintech was the number one sector, receiving $540 million in funding across 94 deals. Following fintech were the logistics and marketplace sectors, receiving $398 million across 12 deals and $304 million across 27 deals, respectively, in the last 18 months. Other key startup sectors included agtech, biotech and edtech, which received $57 million, $16 million and $67 million, respectively, over the same period. Along with increased funding, a record number of Latin American companies achieved unicorn status, including Brazilian fintech Nubank ($4 billion+) and Brazil-born rideshare giant 99 (acquired by Didi Chuxing for over $1 billion). Colombia also gained its first unicorn, as Rappi, a last-mile delivery service company raised $385 million+ over two rounds in 2018, the latter at a $1 billion+ valuation. Investors in Latin American startups also included some of the most notable in the VC sector, such as Ant Financial, Tencent, Softbank, DST Global and Goldman Sachs. While the last couple of years have been a true watershed moment for Latin American VC and startups, the region should also be optimistic about its future as a tech hub. Below, we dig into some of Latin America’s competitive advantages. Large, underpenetrated market. Latin America’s GDP approaches almost $10 trillion, which makes it larger than India and almost approaching China. Moreover, Latin America’s population has high rates of mobile connectivity—as of 2017, there were 690 million mobile connections in the region (and 60% were smartphone connections). However, banks and industrial complexes continue to dominate the market, leaving plenty of space for disruption. High quality engineering talent. After India and China, Mexico now has the largest pool of engineers in the world. Thanks to strong technical institutions, such as Tec de Monterrey, Mexico has been able to develop top tech talent. In Colombia, strong tech programs at Universidad Nacional de Colombia and Universidad de Manizales have fostered a tech-savvy community (one-fourth of the population of Manizales aged 25 – 34 has a tech degree). Additionally, according to Stack Overflow, the average reputation of top engineers was higher for Latin American countries like Peru, Colombia, Chile, Argentina, and Brazil than for India and China. Growing institutional support. As local success stories (like Brazilian ride-hail giant 99) continue to arise, Latin America is increasingly grabbing the attention of the world’s most deep-pocketed investors and notable accelerator programs. At least six Latin American startups went through Y Combinator this year, including firsts for Chile and Puerto Rico. Accelerators including MassChallenge, Techstars, and Startupbootcamp also expanded their investments in Latin American startups in 2018. Today, accelerators are one of the top avenues for Latin American startups to secure funding and expand internationally.